Thu, Apr 11, 2019, 11:53 pm SL Time, ColomboPage News Desk, Sri Lanka. Apr 11, Colombo: A ceremony to distribute 118 ambulances to hospitals across the country was held under the patronage of Minister of Health, Nutrition and Indigenous Medicine Rajitha Senaratne today at the Colombo Municipal Council premises. The consignment of ambulances included 118 Ford ambulances, each valued at Rs. 9.175 million. 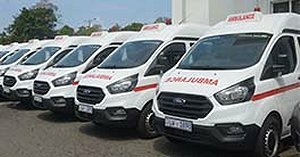 Under the project, 132 Ford ambulances and 60 Benz ambulances have been distributed to island's hospitals in January. Speaking at the occasion, Minister Senaratne said another 40 Benz ambulances have arrived at the Colombo Port. The present government after 2015, has provided ambulances to 42 hospitals under the line ministry and to 203 hospital under the provincial councils. Five ambulances will be provided to the Department of Ayurveda and 10 ambulances will be provided to the newborn baby unit. The Minister said the local political authorities have pressurized doctors and hospital directors not to come to obtain the ambulances and informed that only the local health authorities should receive the ambulances. "But today, ambulances will be provided only officially to the hospital directors and arrangements are being made to distribute the other ambulances with the ministers and MPs in each province." He said in the future 40 other Benz ambulances will be distributed under Austrian loan assistance. The Minister said his goal is to start a good ambulance service. He added that the Health Ministry's official vehicles for daily use are 15-20 years old and 450 new vehicles will be purchased for daily use to regulate the Health Ministry transport service. "My goal is to expedite providing facilities to patients," he said.